Pons: Pons, a portion of the brain lying inferior to the midbrain, above the medulla oblongata and anterior to the cerebellum. The pons is a broad, horseshoe-like shaped mass of transverse nerve fibers that connect between the cerebrum and cerebellum. The pons measures roughly 2.5 centimeters (0.98 in) in length. 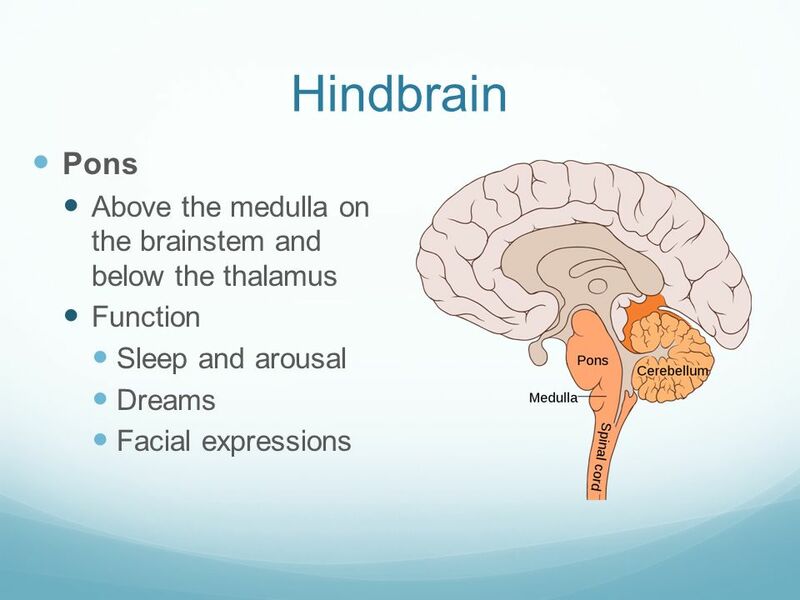 The pons of the brainstem comprises neural pathways and tracts that conduct signals from the brain down to the cerebellum including medulla and tracts that transmit the sensory signals up into the thalamus. 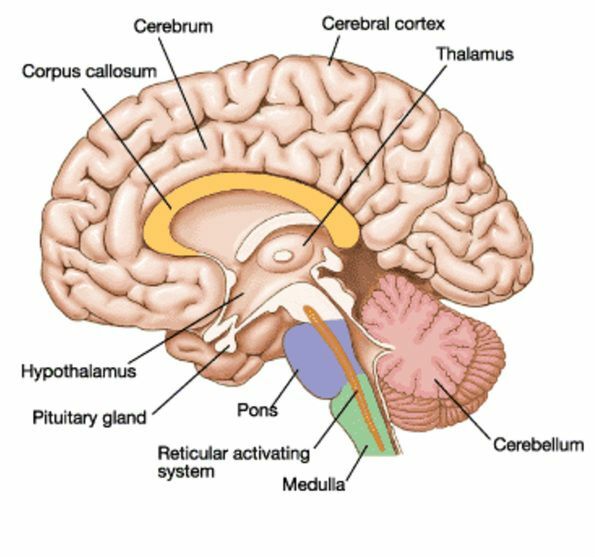 The pons comprises nuclei that carry signals from the forebrain through the cerebellum, along with nuclei that deal especially with sleep, respiration, bladder control, swallowing, hearing, equilibrium, taste, facial expressions, facial sensation, eye movement, and posture. The pons is composed of two significant segments – ventral pons and the tegmentum. The ventral pons comprises the pontine nuclei, which are capable of coordinating movement. Fibers of the pontine nuclei cross the midline and develop the middle cerebellar peduncles on their move to the cerebellum. The tegmentum part of the pons which forms a set of nuclei found throughout the brainstem that are liable for arousal and attentiveness. Injury to this part of the pons may happen in anosognosia for hemiplegia, where victims are ignorant of their paralysis. Descending corticobulbar tracts – responsible for voluntary motor control of face, head, and neck. Ascending spinothalamic tracts – responsible for pain and temperature sensation. Ascending medial lemniscus tracts – responsible for fine touch, vibration, and proprioception. The anterior surface of the pons is a bulging formed by the transverse pontocerebellar fibers. The basilar groove separates the midline of the anterior surface and is where the basilar artery is positioned. Cranial nerve VIII: vestibulocochlear – arises laterally to the facial nerve. Cranial nerve VII: facial – arises from the cerebellopontine angle, the more lateral aspect of the pontomedullary junction. Cranial nerve VI: abducens – arises from the pontomedullary junction, close to the midline. Cranial nerve V: trigeminal – arises from the lateral aspect of mid pons. The facial colliculus of pons is a bulging formed fiber of the facial nerve connecting throughout the abducens nucleus. The medial eminence signifies the midline of the floor. The stria medullaris is a bundle of nerve fibers crisscrossing transversely of the lateral aspect into the midline. They identify the posterior border within the pons and the medulla. 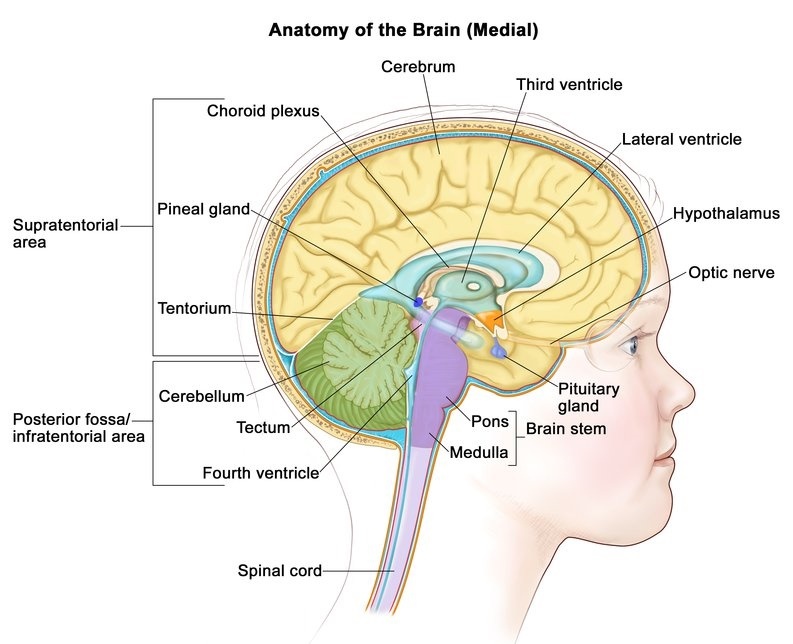 The angle formed at the junction of the pons, cerebellum, and medulla, is another anatomical landmark and is identified at the cerebellopontine angle. Here, the ventricular choroid plexus, cerebellar flocculus, and emerging CNs VII and VIII enclose the lateral apertures the foramen of Luschka, of the fourth ventricle. A tinier part of its blood supply becomes from an anterior inferior cerebellar artery and the superior cerebral artery. The functions of the pons include sensory roles in the hearing, equilibrium, taste, facial sensations such as touch and pain, roles in eye movement, chewing, facial expressions, swallowing, and the discharge of saliva and tears. Center pontine myelinolysis is a demyelination condition that makes difficulty with sense of balance, swallowing, walking, sense of touch, and speaking.